Jazz and Blues fans alike will be familiar with the title "St. James Infirmary Blues." However, this is just one variant of an old song whose history traverses continents and cultures. Tracing the evolution of the tune and lyrics of this standard provides a valuable window into the folk process at work. The song began in England as a ballad, most often known as "The Unfortunate Rake" but also called "The Unfortunate Lad" or "Trooper Cut Down in his Prime." It begins with a frame narrative, telling how a soldier encounters one of his comrades dying of venereal disease contracted from a prostitute. In the second half of the song, the dying man proceeds to give his comrade instructions about the arrangements for his funeral. I was a-walking down by there one day. All wrapped up in a flannel though warm was the day. So they don't smell me as they bear me along. When this song was carried to America, it naturally took on new, distinctly American valences. In the Old West, it emerged as the cowboy ballad "The Streets of Laredo." The funeral instructions took on new images, more appropriate to a cowboy. Get six jolly cowboys to carry my coffin. Six dance-hall maidens to bear up my pall. Throw bunches of roses all over my coffin. Roses to deaden the clods as they fall. 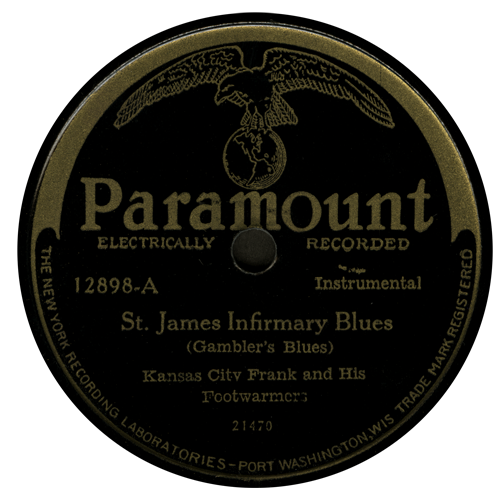 In the American south of the 1920s and 1930s, the song re-emerged as "St. James Infirmary Blues," with notable recordings by Louis Armstrong and Cab Calloway. So you can let all the boys know I died standing pat. Hallelujah as we go along, well. The song may be better known to blues fans in the version by Blind Willie McTell, called "Dyin' Crapshooter's Blues." McTell's version, which he claims to have made up "out of three different marches of tunes," is one of the most involved and elaborate, although it is heavily indebted to an earlier recording by Fess Williams and His Royal Flush Orchestra under the name "Gambler’s Blues" and one by Martha Copeland under the name "Dyin' Crap-Shooter's Blues." Here, the vice that lead to venereal disease in the "Unfortunate Rake" has been exchanged for an addiction to gambling. This same tune was used by Bob Dylan as the basis of one of his greatest compositions, which was recorded in the 80s but left unreleased for decades because Dylan felt that it was incomplete. In homage to McTell's "Dyin' Crapshooter's Blues," the song was titled "Blind Willie McTell." In "History of the Blues" our DJs take you through curious facts and strange tales from the storied annals of the Blues.